Samsung brought a new dimension to the phablets line up with its Mega 6.3 and 5.8 Android phablets. The pricing of the phablets that borrow some of the features from the Galaxy S4 flagship smartphone was not revealed during its announcement, but the pricing details of the phablets are no longer a mystery. Samsung Galaxy Mega 5.8 and Mega 6.3 was officially unveiled in India today and the phablets have been priced at about $445 (INR 24,900) and about $563 (INR 31,490) respectively. 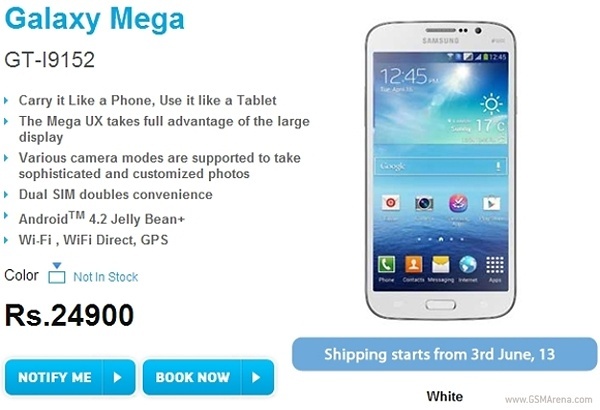 The dual-SIM Galaxy Mega 5.8 will up for grabs, starting from June 3, but there is no word on the availability of the Mega 6.3. Furthermore, Samsung Galaxy Mega 6.3 is up for pre-order from the Clove website in UK and the SIM-free version is priced at £460 (about $695) and will be available in both white and black color options. Meanwhile, we have already previewed the Galaxy Mega 6.3 and have got our hands on the Galaxy Mega 5.8. Check out our first impressions here. A big thanks to all who sent this in! to expensive, make it no business.